Roberto Rosa and Domenico Iriti have spent two decades repairing dozens of deities, numerous saints, and countless angels. The heavenly beings can be found on the stained-glass windows that have been meticulously restored by the artisans at Serpentino Stained & Leaded Glass Inc. in Needham. Rosa's father-in-law, Joseph Serpentino, 93, began working in the stained-glass business in the early 1950s and then went into business for himself, opening his studio in Needham in 1968. Serpentino now has a reputation that extends well beyond the Boston area. The company has restored windows in museums, universities, houses of worship, and government buildings, including the Massachusetts State House and the 16th Street Baptist Church in Birmingham, Ala., where four young African-American girls died in a 1963 white supremacist bombing - a pivotal event in the civil rights movement. Serpentino crews have also completed work on windows at St. Dominic Church in Washington, D.C.; the Culinary Institute of America in Hyde Park, N.Y.; and the Congregation Emanu-El in New York City. Current projects include refurbishing a window from Wellesley College, one from Dean College in Franklin, another from the First Congregational Church of Stamford, Conn., and a window for Sacred Heart Church in Roslindale. The firm just finished a piece from St. Mary's Episcopal Church in Newton. "You never get tired of this work," said Iriti. "Every window that comes in is made from a different artist, so it's always a new challenge for us. When you look at a window from a different church, you see it with different eyes. It's like going to a museum and viewing the work of many artists." People who have worked with the firm attest to its care and artistry. Carl Jay, director of historic preservation for Shawmut Design and Construction, has used Serpentino on numerous projects, including the two windows in the Church of the Advent on Beacon Hill. Both windows had to be restored in sandstone tracery, which had deteriorated over the years. "There are only a handful of stained-glass companies that work on really significant buildings, and Serpentino is one of the only companies from the Boston area," said Jay. "We find that you get the craftsmanship combined with the quality, care, and practical aspect as you're working with someone who understands construction as well as the art." In its serene 5,000-square-foot studio off Highland Avenue, the company restores windows of all calibers, including pieces from the great stained-glass artists of a century ago, such as Louis Comfort Tiffany and John LaFarge. Rosa said one of the most challenging jobs that the Serpentino studio has worked on is the "New Jerusalem" window from Trinity Church in Boston. The 5-by-20-foot window is divided into five sections and has more than 1,000 pieces of glass. "There were between two to six layers of glass unevenly distributed throughout, and it was extremely fragile because the glass wasn't produced properly," said Rosa. "But we welcome the more difficult jobs." Serpentino employs a staff of eight. Although Rosa's wife of 19 years, Maria Serpentino, is a skilled artisan, she primarily oversees the business aspects of the studio, while Rosa and Iriti run the creative side. The five other craftsmen are from Guatemala, Colombia, El Salvador, and the United States. Rosa grew up in Sora, Italy, just outside of Rome, and attended art school. Though born in the United States, he returned to Italy at the age of 7, where he remained until fulfilling his military obligation. He moved to Massachusetts in 1984 and soon met his business partner, Iriti, who hails from Calabria, Italy. The two friends learned the craft of stained-glass restoration on the job, from Joseph Serpentino. Prices for stained-glass repair range from $5,000 to $300,000 per job, depending on the size, how many windows, how many layers of glass, and whether the job requires scaffolding. Serpentino is usually working on five or six projects at a time, though there have been occasions when the firm has spent two years on a single project, such as the Princeton University Chapel in New Jersey. For that job, the contractor had several stained-glass repair studios involved, including one from Philadelphia and another in Long Island. The windows were crated and shipped to Needham for refurbishing, and then returned and reinstalled. Once windows are in the studio they're photographed for archival purposes. Next, the company does two rubbings: one that is used when reassembling the window and another, called a documentation rubbing, that contains information such as which pieces of glass are cracked, the sizes of the panels, the date the window was created, who the artist was, the location of the project, and the dates of restoration. At the start of a project, the artisans dismantle every piece of glass and examine it under a microscope. Tiny cotton swabs are used on the corners to determine if the glass contains dirt or paint. Once dirt is removed by dipping the piece in water, the next layer is tested. "Our goal is to preserve as much of the original glass as possible," said Rosa. "If a section is missing, or it's broken beyond repair, we replace it. If a piece has cracks, we repair it with Hxtel epoxy and conservation-grade silicone or copper-foil repair. And if a line is visible, we have hundreds of colors of dye to mix in." 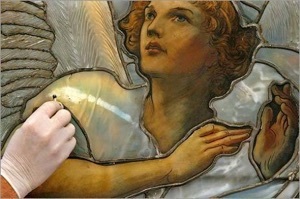 The work may also include restoring the lead that holds a stained-glass window together and can deteriorate over time. Rosa said that the company is restoring treasures for future generations. "We're preserving artwork of our ancestors," he said. "To be given the responsibility to bring them back to life, and conserve them for people to admire for years to come, is very rewarding."